Beau Geste is the sort of book boys of my era loved. Lots of girls too. Heroes setting off into the French Foreign Legion because once upon a time a friend of their aunt had told them stories about it, and besides, what is a noble young man to do if he has just helped his aunt out of an awful mess? Illegally. (Some reviewers seem to have completely misunderstood why Beau joined up). It’s a harrowing story which makes you wonder how people can survive in the desert, let alone under the conditions of the Legion as depicted in the early 1900s. It probably sits well against Patrick O’Brian adventures. I think it’s a rip-roaring story, cleverly told (although I think the abridging may have done it a lot of favours, again based on other reviews). If you can find a condensed version (mine is a Green Dragon book dated 1966), get it. 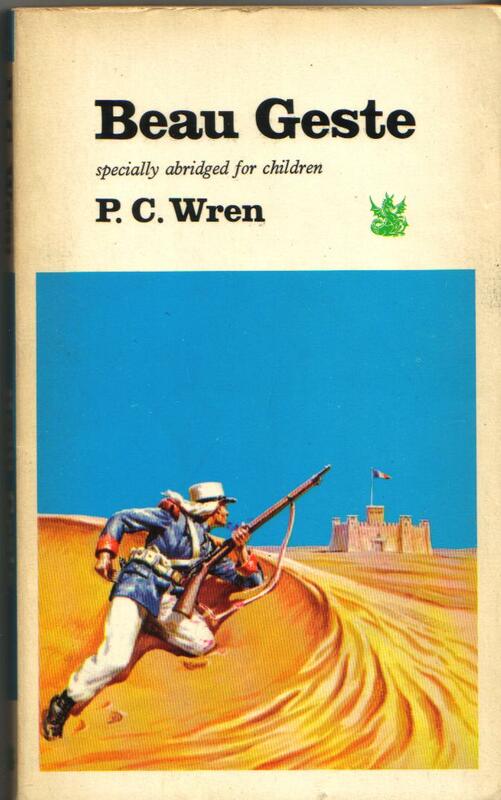 When I judge what an early teen might read I think of this sort of adventure. So that may be why my books have an old-fashioned feel. What I realise is that the unabridged version is probably completely unsuitable for today’s teen, being full (probably) of bad language, death and stereotypical foreigners. I still enjoy my old paperback though. It’s a great read. I may be stretching it, but this is my Classic Children’s Book read for July – well, I read it as a kid.